Liev Schreiber Connection: Top Ten Tuesday: Dare We Dream of Delacorte? But yes, if Liev is involved with the Delacorte's "Measure For Measure" a happiness rainbow will explode right out of me lol OMG YOU WOULD HAVE TO COME DOWN IT WILL BE EPIC AND THE FIRST SHAKESPEARE PLAY LIEV'S DONE IN A WHILE~! I'm not coming until September!!!!!!!!!!!!!!!! I wanna see him do Shakespeare!!!!!!! We don't know if it's true yet. This is 100% me guessing. I have no proof of anything. Maybe you could change your dates? Well I read in the article that mentions him and Sasha going to the fashion show that Liev was considering doing Shakespeare in the Park this summer! So yeah, we can only keep our fingers crossed! Isn't the Delacorte the same thing as Shakespeare in the Park? Not really, from what I understand. The Delacorte is the theater that puts on Shakespeare in the Park; but hey, I might be wrong. 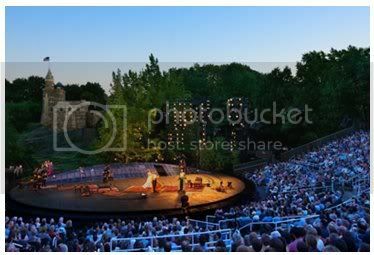 I mean like if the website for the Delacorte is showing M4M in their Shakespeare in the Park series, is that not the Shakespeare in the Park that I was talking about? That Liev would be referring to, I mean? Geek ratio like 10/10 for un-local me. Okay, I think I get it. I think the entire enterprise is called the Public Theatre. There's an indoor theatre, Joe's Pub, some other stuff and the Delacorte all under one umbrella. Well either way, the tickets are FREE!! The only catch is that you gotta wait in line sometimes for hours on end to get tickets, and they sell out ridiculously quick! Won't have the money in the summer, and no time off!!!!!! !